GET THE MOST OUT OF YOUR TRAINING! Avoid problems such as sprained ankles, pulled muscles, and bodily injuries by properly applying tape and prewrap Maximize your performance and get the most out of every session with high-quality sports tape. BE PROTECTED AT ALL TIMES Supports the muscles and joints keeping them safe and strain free. It can also be used to hold training equipment in place, such as knee pads and other gear, so you can be confident that nothing will go wrong during your entire training session. 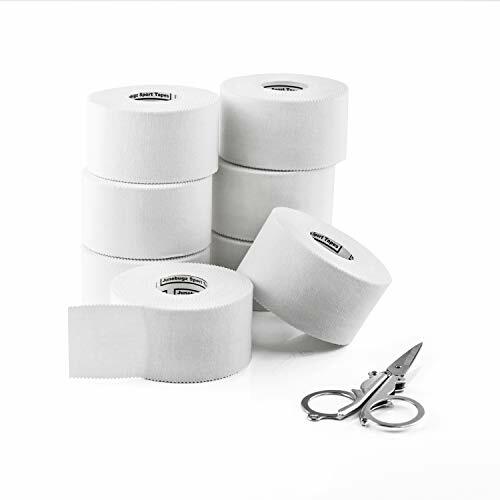 PRODUCT FEATURES: Used by Professional Athletes, Trainers and Coaches High-Grade Cotton cloth tape Hypoallergenic: Free of Latex Durable and Versatile PACKAGE INCLUDES: 8 Rolls of Athletic Tape 1.5" X 45 ft. and a Bonus Folding Scissors. ✔️ COMFORTABLE- 100% ULTRA BREATHABLE COTTON avoids Moisture/Sweat Build up. Hospital Grade Material to avoid Skin Allergy Reactions/Irritation and to Maximize Adhesion to Skin. NO GLUE LEAVE ON YOUR SKIN. ✔️ PREVENT- Avoid Injuries such as Sprains, Strain, Skin Abrasions or scratches during Sports or intense Activities. Perfect for Physical Therapy Rehabilitation. ✔️ PROTECT- Support and Stabilize Joints, Ankles, Wrists, Hands, Thumb, Knees, Elbows, Toes, Feet, shoulders, Achilles, Heels, Medial Collateral Ligament (MCL). Great for Patellofemoral ( Runner's Knee) Taping and Providing Rigid Joint Immobilization/Limitation of Movement when Needed. ✔️ STRONG- Non-elastic, Rigid Tape Adheres Strongly. Perfect for ANY SPORTS such as Gymnastics, Football, Soccer, Running, Boxing, Baseball, Wrestling, Volleyball, Hockey, Weight lifting, CrossFit, Yoga, Lacrosse Sticks and Pole Vault, etc. Stays in Place yet EASILY REMOVABLE. If you have any questions about this product by JuneBugz Enterprises, contact us by completing and submitting the form below. If you are looking for a specif part number, please include it with your message.